Today was really about Cowdenbeath beating Cove Rangers to ensure our Lowland League survival, and with that done this semi final was an excellent game where after leading twice through a Tommy Patterson penalty and a scrambled Llial Smith goal we were eventually beaten in extra time. When we were leading 2-1 we had a goal disallowed for offside and two attempts scrambled of the Strollers line. However, Strollers, a very good side, eventually beat us with some superb goals and all the best to them in the final. A big thanks to our players who over the last two months have fought hard to ensure our place in the league, after the horrific injury problems we suffer throughout the season. For sure we will be better placed next season, and also a big thanks to supporters and sponsors for their support during the season. 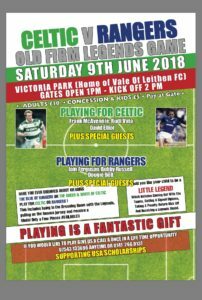 Hopefully soon we will be announcing some tasty friendlies for the new season plus a Old Firm Legends game at the park in June. Vale headed to Dalbeattie following a disappointing draw with Cumbernauld Colts on Wednesday. Vale started the game with only Chris Anderson and Ross Brady on the bench. However, after a promising start Vale were rewarded in the 5 minutes when a Sean Stewart cross was knocked home by Jordan Finnie. The first half was fairly even pressure wise, but in the 28 min after some slack play on the Vale left a cross from the right was headed home by Star’s Tommy Muir. The first half finished with no side taking control. Vale replaced Andy Martin at half time with Anderson. In the 55 min Anderson was through on the goalie only to be thrawted by his out stretched legs. Vale regained the lead in the 57 min when a 20 yard shot was fired home by Finnie. With Anderson showing some good touches Star were struggling to contain him and in the 80 min he was eventually brought down in the box. Tommy Patterson stepped up and hammered the ball home from the penalty spot. With Vale in command another move resulted in Sean Stewart being brought down by the Star goalie. Finnie took this penalty to complete his hatrick. In the last minute of the game Star got a consultation goal when Hugh Cameron headed home. Although this game left Vale in second bottom spot, Cowdenbeath drawing away to Cove Rangers in the play off, keeps Vale’s hope of survival alive, and after another good performance they deserve another season in the Lowland League.